Members of the Mathematical Institute have been researching twistor theory since 1970s. This area is still very active, and enjoys fruitful interaction with the String theory and geometry groups in addition to members of theoretical physics in Oxford, particularly in the study of scattering amplitudes. 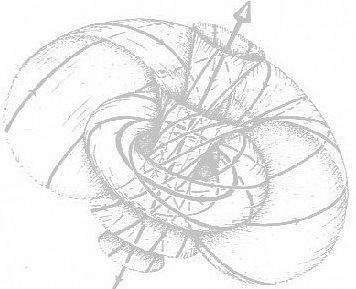 The twistor programme was introduced by Roger Penrose in the 1960s as an approach to the unification of quantum theory with gravity. He proposed that twistor space should be the underlying geometric background on which physical theories are defined, from which space-time itself together with its physical fields should emerge. Twistor space is three-dimensional complex projective space and physical quantities are encoded in terms of deformations of certain complex structures on this space. It is therefore radical as space-time itself together with conventional physical fields thereon must emerge from these deformed complex structures. Nevertheless, it has so far been very conservative: calculations on twistor space give the same answers as on space-time, although they are often simpler, manifest the full natural symmetries, and are dramatically more efficient. Paradigms for this picture were discovered by Penrose and Ward in the late 1970s. Twistor space is chiral and treats the left and right handed parts of physical fields differently. Their constructions work for the right handed parts of physical fields such as the graviton for gravity and the gluon for the strong elementary particle interactions, encoding the full nonlinear structure of these fields. Although these constructions had wide application across pure and applied mathematics, the restriction to just the right handed parts of the fields held up applications to basic physics for a quarter of a century. However, in 2003, Witten's ground-breaking paper on twistor-string theory showed how full physical theories, including both left and right-handed parts of physical fields together with their full interactions, naturally arise when a string theory is introduced into twistor space. The geometry of strings combines naturally with the Penrose-Ward transform to give a completely new vision for how both string theory and twistor theory should make contact with physics giving rise to left-right symmetric theories on space-time. Witten’s work mostly impacted on the world of scattering amplitudes. These are outputs from quantum field theories that determine probabilities of scattering processes. Not only do they enable the comparison of elementary particle models to experiment in collider physics, but they also give deep insights into both the mathematical and physical structures of quantum field theories. Witten showed that they have a remarkably simple structure in twistor space; in particular amplitudes are supported on algebraic curves. Such twistorial representations of amplitudes have become been the subject of much recent activity with and there has been much dramatic recent progress both computationally and in uncovering new and unexpected mathematical structures. There are by now a number of new twistorial representations with links to many areas of pure mathematics involving Grassmannian residue formulae, polyhedra (including the amplituhedron) and holmorphic linking. More recent work has focussed on ambitwistor strings, worlsheet holomorphic (chiral) string theories whose target space is the space of complex null geodesics. They provide the most compact formulae for scattering amplitudes currently available now for a great variety of theories in different dimensions including loop integrands. Other more traditional avenues have been the interaction between twistor theory and integrable systems and integrable geometries and these continue to bear fruit. Please contact us for feedback and comments about this page. Last update on 4 February 2019 - 23:10.